Organized by the Austin Area Heritage Council, members of the community gathered at the MLK statue on the UT campus before marching to the Texas Capitol and then on to Huston-Tillotson University for a festival. Fenves said the positive actions of the community members in attendance are part of the solution to issues that are still being faced today. Several other UT faculty were in attendance at the opening program — Brenda Burt, African and African diaspora studies professor, gave the opening remarks, while Leonard Moore, interim vice president for diversity and community engagement, introduced Fenves. Edmund Gordon, vice provost for diversity, discussed education inequity in Austin. 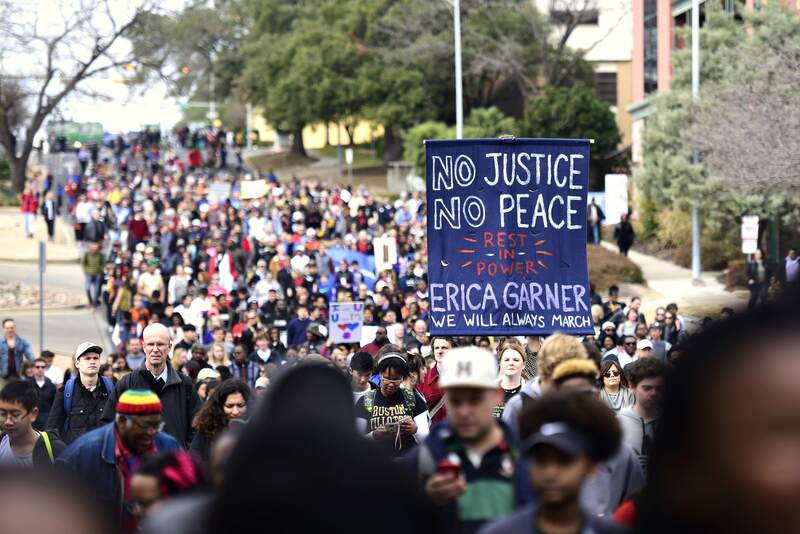 After the opening ceremony in front of the MLK statue, thousands marched from campus to the Texas Capitol to hear from other community members. Following the ceremony at the Capitol, the community marched to the Huston-Tillotson campus for the festival. There were dozens of booths from local community organizations and companies, as well as some from UT departments and organizations. There was also a blood drive booth and a food donation drive for the Central Texas Food Bank. Among the thousands of community members gathered were several students and local members of black fraternities and sororities. The brothers of Alpha Phi Alpha, the national fraternity that King was a member of, lead the march and helped with some of the event setup. “He was one of our brothers, and we believe that he exemplifies what we mean as a fraternity,” said Eric McDaniel, president of the Austin Alpha Phi Alpha chapter. McDaniel said his fraternity attends the celebration every year to honor King and continue being active in the community. MLK Day was signed into an official holiday by President Ronald Reagan in November of 1983, 15 years after King’s assassination. This was the 35th annual Austin MLK Celebration. The celebration began in 1983 on the UT campus, planned by the African-American Culture Committee. In 1993, UT joined with Huston-Tillotson University for the festivities, and in 1995, the Austin Area Heritage Council was formed to plan and oversee this massive event.